The University of London featured in six semi finals on HRR Saturday, with four crews contesting finals on Sunday and two composite crews taking home red boxes. UL’s CharlotteHODGKINS-BYNE(Royal Holloway), with her doubles parter Anna Thornton, raced the GB U23 lightweight 2x in Sunday’s final. Charlotte & Anna took the lead early in the race and continued to move away to take victory, setting the record to the Barrier and Fawley markers. Charlotte added a HRR medal to last month’s Henley Women’s medal, ahead of travelling to the U23 World Championships later in July. 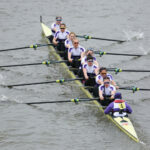 UL had two entries into the Town, with Sara PARFETT(King’s College, London) at bow in the Great Britain Senior Women’s Four, racing as University of London & Leander Club. They took victory over Molesey Boat Club in Sunday’s final, setting the record to the Barrier and Fawley markers. ULBC also had a full UL student entry into the Town Cup, who impressively defeated a USA U23 crew on Friday before losing to Molesey Boat Club on the Saturday. 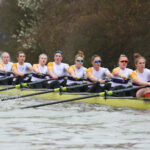 The Great Britain Women’s Eight, racing as Leander Club & University of London, coxed by UL’s Matilda HORN defeated Washington University, USA in Saturday’s semi final before racing the Australian National Eight in the final. The Aussies took an early lead and held on to win. The UL entry into the Visitors defeated a GB U23 crew in the quarter finals, a New Zealand entry in the semis containing some of the Kiwi squad from the Rio Olympics before facing Leander Club in the final. Leander took an early lead in the race and stayed ahead to the finish, breaking all records in the process in what was a very fast race. This was the first all UL crew to feature in an Intermediate event final at HRR in 17 years. The majority of this crew will now be targeting selection for the upcoming World University Championships. UL’s Prince Albert Coxed Four, a selected crew, beat Dutch opposition in the first round on route to Saturday’s semi final and equalled the Barrier and Fawley records. 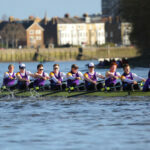 Their campaign though was halted by eventual winners Imperial College on Saturday, despite UL leading to both the Barrier and Fawley markers. Two of this crew are now seeking selection for the U23 World Championships in Poznan, Poland. University of London crews race next at the European University Championships in Portugal. UL will contest the Men’s & Women’s Eights, Men’s & Women’s Coxless Fours and the Women’s Quad, the event we’re currently European Champions in. Meanwhile our leading athletes are attempting selection and training for the World U23 Championships and World University Championships.